Have you just completed a children’s picture book and are now in need of a publishing house with expertise in publishing works in this genre? 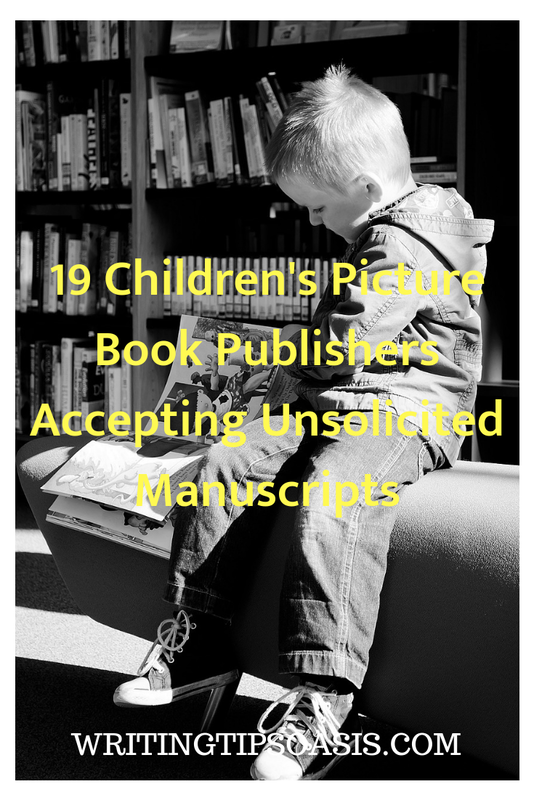 Take a look at the following 19 children’s picture book publishers accepting unsolicited manuscripts. Flash Light Press specializes in children’s picture books and has a long roster of successful and even award-winning publications like “Being Frank,” written by Donna W. Earnhardt and illustrated by Andrew Castellani, winner of the Alabama Camellia Children’s Choice Book Award and Washington Children’s Choice Picture Book Award. They are currently accepting submissions for children’s picture books via email, with specific interest in stories targeted at four to eight-year-olds. For more information on their submissions guidelines, click here. They ask that you include the title of your story, the word count, targeted age, subject or theme of your story, a summary of the book in three sentences or less, and a manuscript attached in Word or PDF form. When the publishing company was founded in 1991, they had a simple goal in mind: publish diverse stories that every child could enjoy. They love to work with authors and illustrators who have previously been unpublished because they believe that everybody deserves the chance to have their stories told. As an independent publisher based out of the United States, they are actually one of the country’s largest multicultural children’s book publishers. They are currently accepting unsolicited submissions for children’s picture books, middle-grade books, and graphic novels. Right now, they are especially interested in stories that “incorporate non-traditional family structures and gender or sexual identities, or stories that feature a person with disability.” They ask that you send your manuscript via mail, and that any illustrations that you send should be copies, not originals. Based out of Wiltshire, England, Hogs Back Books publishes children’s picture books for readers up to 10 years-old. They look for stories that are whimsical, entertaining and creative to their young readership. Having published books like “Boris the Boastful Frog” by Karen Hodgson and Steve Cox. They are currently seeking unsolicited manuscripts from both unrepresented and represented authors. For a full list of submission guidelines, click here. They ask that you send your submission by either email or regular mail. Hogs Back Books is unable to return manuscripts after reviewing them, so be sure to send copies of any illustrations that you have and not the original copies. Albert Whitman & Company has been in operation since 1919 and has published numerous award-winning children’s books. Based in Park Ridge, Illinois, the publishing company has an open submission policy. They are more than happy to review un-agented manuscripts and proposals for children’s picture books. For picture book submissions, they ask that you send your manuscript via email and attach any illustrations separately in either PDF or JPEG attachments. In your cover letter, be sure to include a brief description of the story, a short author bio, and up to three comparative titles to give a general sense of who your intended audience will be. Operating out of Watertown, Massachusetts, Charlesbridge strives to publish high-quality books for children in pursuit of turning them into lifelong learners. Charlesbridge has published children’s picture book series like “Ace Lacewing, Bug Detective” by David Biedrzycki and the “Eat Your Homework” series by Leeza Hernandez. They are currently seeking unsolicited manuscripts via mail only. They ask that you don’t include a SASE, as they do not return submissions due to the high volume of manuscripts that they receive. Founded in 1922 by William B. Eerdmans, this publishing company initially began with a focus on theological publications, but quickly evolved to include topics to do with religion and religious studies. They are currently accepting submissions for children’s picture books, and are especially interested in stories that provide good moral lessons. They ask that you send submissions via mail. They ask that you don’t include an SASE, as they receive so many manuscripts that it’s impossible for them to return every single one. Free Spirit Publishing was founded by Judy Galbraith, a former classroom teacher and specialist in gifted education in 1983. Based out of Minneapolis, Minnesota, this publishing company is interested in books and stories that help young readers expand their minds and learn to think for themselves. They are currently seeking unsolicited manuscript submissions via mail only. They ask that you include a cover letter that briefly outlines your story, the intended audience, and your relevant experience. Be sure to include a current résumé, a detailed story outline, and at least two sample chapters. Peachtree Publishers was founded in 1977 by Helen Elliott in Atlanta, Georgia with the intention of emphasizing works written by Southern writers. This publishing house has worked with award-winning and best-selling authors and illustrators like Stephen Alcorn, Colin Bootman, Henry Cole, and Carmen Agra Deedy. 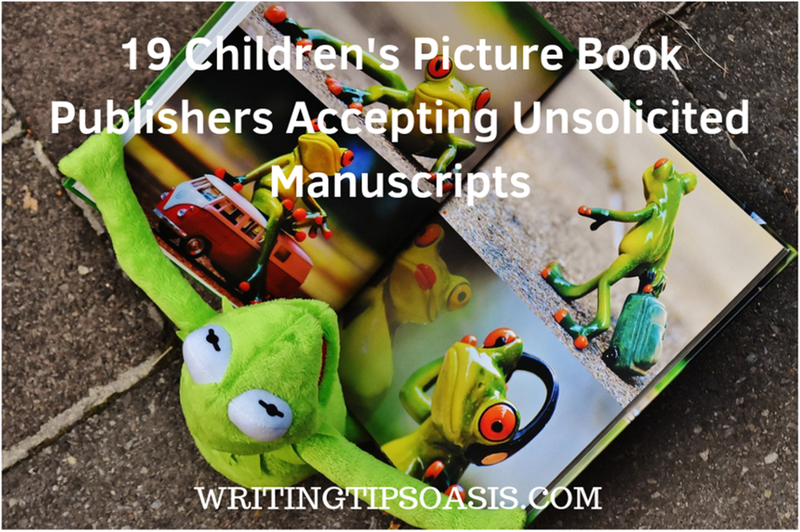 They are currently accepting unsolicited manuscripts for children’s fiction and nonfiction picture books via mail only. Be sure to include a copy of the full manuscript, a query letter, a brief author bio, and a SASE for a response. As an independent publishing company, Imagine That has nearly twenty years of experience in the industry. Previously known as Top That Publishing, the company strives to publish engaging activity and craft books for their young readership. Having published picture books like “Baby Bear” by Ellie Patterson and “Big City Kitty” by Susie Linn, they have an extensive roster of impressive children’s stories. Imagine That is currently accepting unsolicited manuscript submissions from authors, illustrators, and designers. They prefer to receive submissions by email, but can also accept them via post. The only draw back with sending your submission by post is that they will be unable to return it to you, so be sure to send a copy of your manuscript and not an original version. As a subsidiary publishing group with Penguin Young Readers, Dial Books for Young Readers aims to publish stories intended to entertain, teach, and encourage children. They have published Newbery Honors like “Roller Girl” by Victoria Jamieson and “The War that Saved My Life” by Kimberly Brubaker Bradley. Founded in 1961, Dial Books has a long history with working closely with their authors to produce high-quality and engaging books. Update: As of 22nd January 2019, Dial is not accepting unsolicited manuscripts. Workman Publishing Co. Inc. is an independently owned family of publishers that includes Workman Publishing. They believe in giving new and unrepresented authors the opportunity to tell their stories, and have followed this since the company’s inception in 1968. Arthur A. Levine is a vice-president of Scholastic Inc. who founded Arthur A. Levine Books in 1996. The publishing company has worked with a wide range of distinguished authors including Sarah Moon, Daniel José Older, Francisco X. Stork, and has even worked with illustrators that have worked with J. K. Rowling. They are currently accepting unsolicited manuscripts for children’s picture books. They require a query letter and the full manuscript to be sent via their online submissions portal. Based out of Atlanta, Georgia, August House has been producing children’s books for nearly thirty years. Many of their books have won awards like the National Parenting Publication Awards, CCBC Choices, the IndieFab Awards, and The Bank Street Center for Children’s Literature Award. August House accepts proposals and editorial inquires by mail only. They are looking for children’s picture books that have strong narratives, with specific interest in old folktales from a diverse set of cultures. They do not accept phone calls or emails. If you would like to hear a response or have your manuscript returned, they ask that you please include a SASE. Boyds Mills Press is a division of Highlights for Children, which was established in 1990. The publishing division produces picture books, chapter books, novels and nonfiction stories that are heavily narrative driven. One of their most recent works includes “I Just Like You” by author Suzanne Bloom and “Dreaming of You” written by Amy Ludwig VanDerwater and illustrated by Aaron DeWitt. They welcome unsolicited manuscripts from both published and unpublished writers and illustrators. For picture books, they ask that you submit the entirety of the manuscript for your picture book by email. Kane Miller EDC Publishing aim to publish children’s picture books that are not only colorful and entertaining, but also educational. One of their most recent publications, “Chef Academy” by Steve Martin and illustrated by Hanna Bone, offers young readers an engaging introduction into the world of culinary arts. While they are currently accepting unsolicited manuscripts, the staff at Kane Miller is unable to respond to every single submission due to the high volume that they receive. They ask that you send your submission by email, and in the body of the email to include a short cover letter, the complete manuscript, a total word count, and a brief author bio. Pants On Fire Press is an traditional, independent publishing house based out of Florida. They are currently accepting unsolicited manuscripts from authors, and have an entire division dedicated to children’s picture books. They accept submissions via email only, and they request that you include a synopsis of your story, the genre of the book, an approximate word count, and your contact information. For more details about their submission guidelines, or to get in contact with the publishing company, click here. With nearly forty years of experience, over a million of their books sold, and more than forty award-winning books, Tilbury House Publishers is a dedicated independent publishing company that works hard to promote their authors’ stories. Founded in 1190 after merging with another small publisher, the Dog Ear Press, Tilbury House aims to publish picture books that broaden their young readership’s imagination. They are currently accepting unsolicited manuscripts by either their online submission form or via email. It should be noted that they are not looking for fables, fantasies, picture books with talking animals, or other fiction, and are more focused on producing books that explore culture, nature and the environment, history, biography, and science. As an independent, family-run children’s book publisher, the staff at Ripple Grove Press are passionate about producing well-told and beautifully illustrated stories for children. They are currently accepting unsolicited manuscripts, but ask that you take a look at their submission guidelines to understand exactly what types of stories they are looking for. They accept manuscripts by either mail or email, and ask that you don’t include an SASE, as they do not return hardcopies. One of Tanglewood’s most famous publications is the New York Times best-seller “The Kissing Hand” written by Audrey Penn and illustrated by Ruth E. Harper and Nancy M. Leak. Based in Indianapolis, Indiana, Tanglewood is currently accepting unsolicited manuscripts for children’s picture books. For more information on the types of narratives they’re looking for, click here. They accept submissions by email only. They will respond to you if they are interested in your work, but ask that you don’t send follow-up query emails, as they receive a high-volume of submissions and it would be difficult to respond to every single one. Do you know any other children’s picture book publishers accepting unsolicited manuscripts? Please tell us about them in the comments box below! This is a great resource for children’s book publishers! Thanks for the great information.